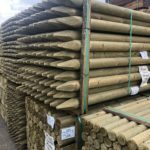 All the round fence posts and stakes featured on this page are available from stock with delivery in 2-5 working days. Tanalised pressure treated, pointed, natural stakes in circa 3″-4″ diameter. Here at Oakdale we have a full range of round fence posts for sale. These posts are ideal for agricultural or domestic use. Commonly used for fence lines that incorporate wire mesh fencing or single strand wire fencing, these timber fence posts can be easily installed. Simply use a driving hammer or concrete the post in to form boundaries to prevent livestock from straying. 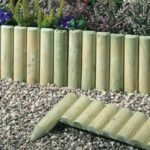 All our round and half round posts are pressure treated tanalised timber so you can be sure they are durable and will give years of service. The preservative treatment prevents damage from fungi and insect and is safe to the environment and animals. 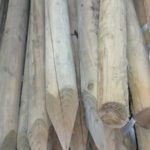 Machine round fence posts are timbers that have been shaped by machine for a smooth round finish and come with a shaped point. Machine round fence posts are easy and quick to install. We offer three basic sizes, posts that are 3 or 4 inch diameter and posts that are 6 inch diameter. Our 3 and 4 inch post comes in lengths of 6ft and 8ft and are ideal as intermediate posts or posts that can be used as struts. Our 6 inch diameter heavy duty post comes in 8ft lengths and is ideal for use as end posts and straining posts. Normally we would recommend you use the larger post at the end of the fence line and at 50m intervals as a strainer post. The smaller round post is usually used at 3m intervals along the fence line and as struts off the end posts and strainer post. End and strainers are usually concreted in to position. 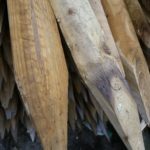 Treated fencing stakes are posts that have been peeled of their bark rather than shaped by machine and have a pointed end. These posts come in two groupings, 2-3 inch diameter, 3-4 inch diameter. The posts are available in 6ft and 8ft lengths. These posts are used in much the same way as the machine rounded posts but offer a little more saving in terms of cost. Ideal for a quick installation of stock proof fencing or a simple single strand boundary marker. Our range also includes machine round split rails and split stakes. The machine round split rails come in 12ft lengths and are available in two diameter sizes : 3.5 inch and 4 inch. Our split stakes are available in 6ft long by 3 inch or 4 inch diameter. The split rails are ideal for equestrian fencing or can offer a nice variation to a standard post and rail fence when the split is used instead of the normal rectangular rail. The stake can be used for cost saving, over the machine rounded version to repair existing stock or wire fencing or alternatively can be used where smaller animals are to be penned. We carry stocks of these items throughout the year and can supply the full set up needed for most types of stock proof fencing or wire mesh fencing that would be used with these posts. Check out our stock and wire fencing here .